Shopping for Buck Rogers Statues? Straight from 1928 to the modern day! ReelArt Studios is proud to present Buck Rogers, Philip Francis Nowlan's seminal hero who first appeared in the novella Armageddon 2419 A.D. in the 1928 issue of Amazing Stories. This 1950's version of Buck is sculpted by Tony Cipriano and paint mastered by Joy & Tom Studios. 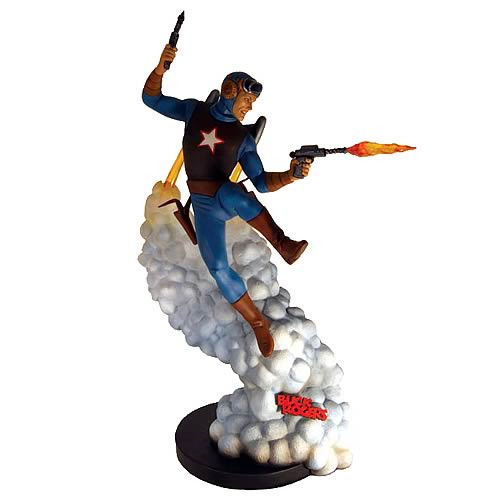 It depicts Buck in action with blazing guns and rising on a cloud of smoke from his jet pack. Limited edition of 500 pieces.